Japanese cherry trees beautify gardens and landscapes around the country in the spring when the flowers bloom. The trees also offer visual interest to fall gardens when their leaves turn shades of red, yellow and gold, depending on the variety. Japanese cherry trees became better known when the Japanese government gave the United States a gift of more than 3,000 cherry trees in 1912. These trees, planted in several locations in Washington, are the focus of the annual National Cherry Blossom Festival. The Yoshino cherry tree, introduced to Tokyo in 1872, produces branches full of fragrant, five-petaled, white blossoms with a faint hint of pink. The tree features an Oriental branching pattern and a trunk with glossy bark. The tree grows up to 45 feet in height and up to 40 feet in width in USDA Hardiness Zones 5 to 8. Its upright habit makes it ideal for planting near sidewalks and patios. The tree benefits from protection from windy conditions or late frosts since its flowers bloom so early in the spring. The Yoshino cherry tree grows best in full sun in well-drained soil of almost any kind. The tree also benefits from pruning to help develop the strong structure it is known for. The Yoshino produces small fruits attractive to birds. 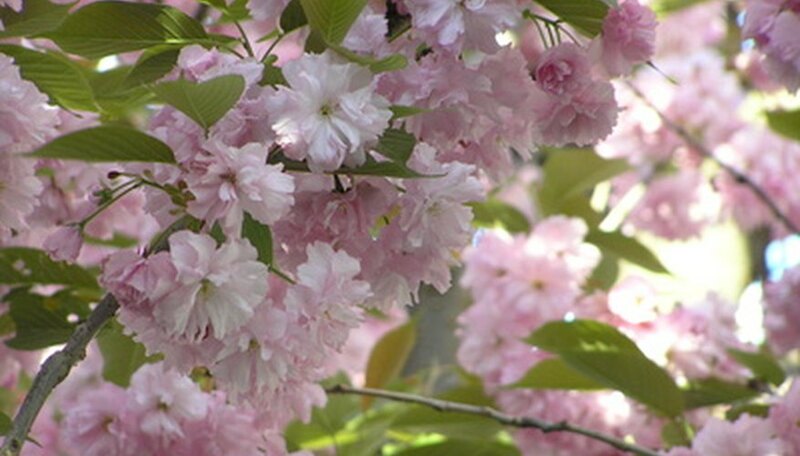 The Kwanzan cherry tree features branches covered with clusters of deep-pink double blossoms resembling carnations. This favorite tree reaches up to 40 feet in height and width in hardiness zones 5 to 9. Kwanzan cherry trees start blooming in April. In the fall, the leaves turn beautiful shades of gold. The tree thrives in full to partial sun in almost any soil as long as it drains well. The tree attracts lots of pests, however, including borers, scales, spider mites and aphids, which may make the tree look damaged. The weeping Japanese cherry tree, known as Shidarezakura in Japan, features drooping branches dripping with pinkish-white blossoms. The boughs of the tree almost reach the ground, with the flowers appearing in late March or early April. Weeping cherry trees make good shade trees as well as single-specimen trees in the garden or along a lake or pond. The trees prefer full to partial sun in well-drained soil in hardiness zones 5 to 8. The tree produces tiny fruits favored by birds and small mammals, including squirrels. A late-blooming cherry tree, Fugenzo also goes by the name Shirofugen. The tree features blooms with 30-to-40 petals per flower that appear in mid- to late-April. The long-lasting flowers start out whitish-pink in color and deepen into a darker pink over time. The new leaves emerge copper-brown in color, giving the tree added color. The tree reaches up to 20 feet in height and width and prefers full to partially sunny areas in well-drained soil in hardiness zones 5 to 9. Which Flowering Trees Bloom the Longest?